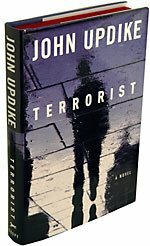 In this post I speculated that the teenaged titular character of John Updike's Terrorist runs into trouble because he seeks a connection with his long-disappeared father, who he idealizes as he idealizes Islam, when he should focus his search for identity on his mother, a good provider with a quasi-bohemian spirit, who I think Updike created as a proxy for America (or modernity). I also argued that the teenager's quest is exploited by a few killers to further their goals of mass murder, and that had the teenager just a year or two more to learn to see the world clearly, he would avoid trouble. While I was writing about a story, this article by Dahlia Lithwick at Slate explores some related issues in the real world of politics and the law. The novelist and law professor Alafair Burke recommended Kermit Roosevelt's In the Shadow of the Law for our series on what's at stake in the debate over habeas corpus. Now, law professor Tung Yin, who won a contest related to that series, has a review of In the Shadow of the Law on his blog. His bottom line: "Roosevelt's novel is far more realistic than many legal novels, but in the end it is a novel and that's how it should be judged--a very good novel about people who happen to be lawyers." A recent post pointed to John Updike's New Yorker review of Wizard of the Crow by Ngugi wa' Thiong'o. This item in the Independent discusses the heartbreaking path Wa Thiong'o has followed to survive and finally see his book published.